The red bird is the girl's heart. It's got a safe and comfortable place to be, a place that's got green leaves on it that are starting to grow. 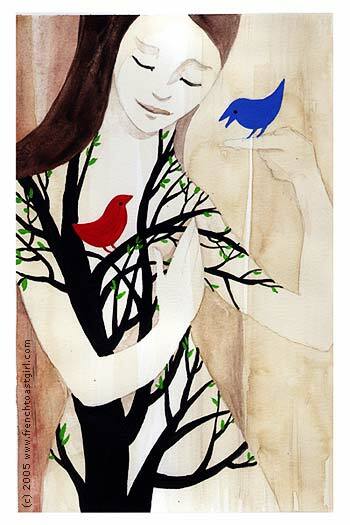 The blue bird is singing to the red bird that it's okay to come out, to fly, to try new things and new adventures. It will always be able to return to that safe place, but it has to take a chance. The girl? I think she's a little ambivalent. She's nurturing towards the red bird - she's almost cradling it and trying to shield it, but at the same time, she's holding the blue bird right up close so they can talk to each other. I think she knows it's time for a change and is hoping the red bird will make the right decision and fly away, free. Get a Wakeup call from Kermit the Frog!